Want some Hawaiian flavor for your morning bagel? If so, then lightly sprinkle some Luau Pork Seasoning on your bagel with cream cheese and taste flavor of Hawaii! I opened the refrigerator door to get the Cream Cheese and I wanted to add some Hawaiian flavor. I decided to give one of my gourmet Lahaina Spice Company’s spice and seasoning a try on my begal. At first I wasn’t sure as I usually grab the Kiawe Spice which is a chipotle, garlic, pepper, smoked Paprika and other great flavors. I’ve been known to put Kiawe Spice on just about anything. Just as I was going to grab it I thought the about the Luau Pork Seasoning and its Hickory smoked salt, garlic and chili pepper flavor. Torn between the two I grabbed the Luau Pork Seasoning, and yes, what a good choice that was. The Luau Pork Seasoning left my bagel and cream cheese exploding insane Hawaiin flavor. 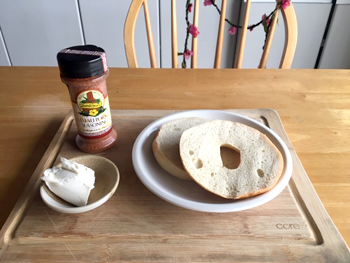 Want to spice up your bagel and cream cheese? Try it with some of Lahaina Spice Company’s Luau Pork Seasoning. It will make you day Hawaiian! Visit our spice and seasoning shopping page to see our full collection of Hawaiian spice and seasoning by Lahaina Spice Company.